A silky smooth, decadent coconut milk ice cream that you can make sans ice cream maker—all you need is four ingredients and some patience! Craving a silky smooth, frozen treat? Try this four-ingredient coconut milk ice cream—no ice cream maker necessary! This simple treat is Paleo, vegan, gluten-free, and comes together with little effort. The four-ingredient base produces a super creamy, straightforward coconut ice cream, but the variations are limitless. With only 25 minutes of prep, the hardest part of making this coconut milk ice cream is waiting for it to freeze. Your patience will reward you with a rich and Paleo-friendly treat. The secret to an ultra-creamy yet dairy-free ice cream base is full-fat coconut milk or if you want something even creamier, coconut cream. We’re not talking about the sugar-laden drink mixer cream of coconut, but coconut cream, a thick cream made from simmering coconut meat and water together. You can find coconut cream at most health and specialty food stores, online, and occasionally in your grocery store’s Asian foods aisle. If you don’t have access to coconut cream, after chilling a can of full-fat coconut milk in the fridge overnight, scoop out the cream that separates from the liquid and voila, coconut cream. Whipping the coconut milk into a thick, luscious base (with help from thickening agent tapioca flour) helps it freeze with the texture of ice cream, without using an ice cream maker. Still, if you happen to have an ice cream maker on hand, this base would work for that, too. This ice cream is definitely for coconut lovers, as the fruit’s flavor is prevalent throughout the treat. You’re free to riff on the ice cream as much as you’d like, though. Balance the coconut flavor with pureed fruits like mango, raspberry, strawberry, and more. Add in nuts, coconut flakes, chocolate chips, or whatever you please for texture. Melt dark chocolate over the ice cream for a decadent but preservative-free, antioxidant-rich “magic shell,” or make chocolate ice cream by adding cocoa powder to the base. You’ve got options! No ice cream maker is needed for this 4-ingredient, dairy-free ice cream! Chill canned coconut milk and mixing bowl in the freezer for 15 minutes. With egg beaters or a stand mixer, whip together in chilled bowl the chilled coconut milk, maple syrup, vanilla extract, and tapioca flour slurry until thick and creamy—around 5 to 10 minutes. 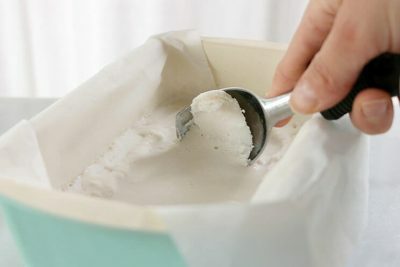 Pour ice cream base into a lined freezer-safe container, then wrap gently with plastic wrap and foil. Freeze for at least 4 hours up to overnight.